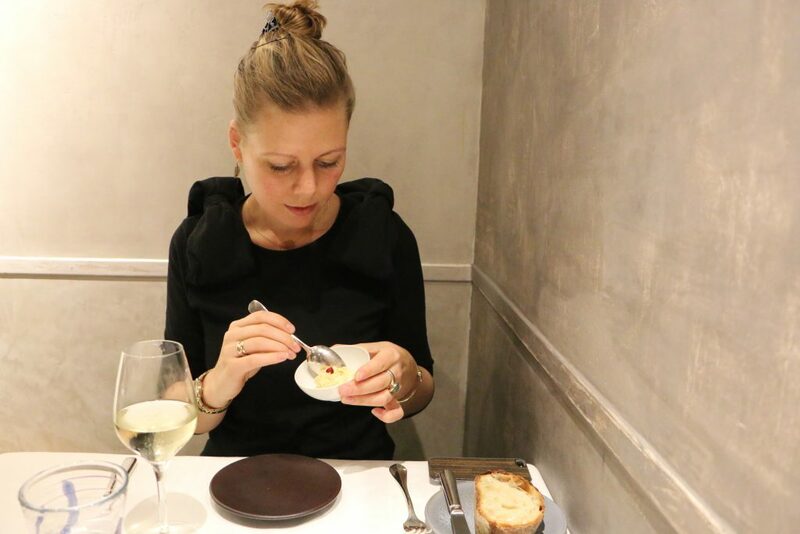 La Truffière restaurant is discrete and well-hidden in the 5th area of Paris. 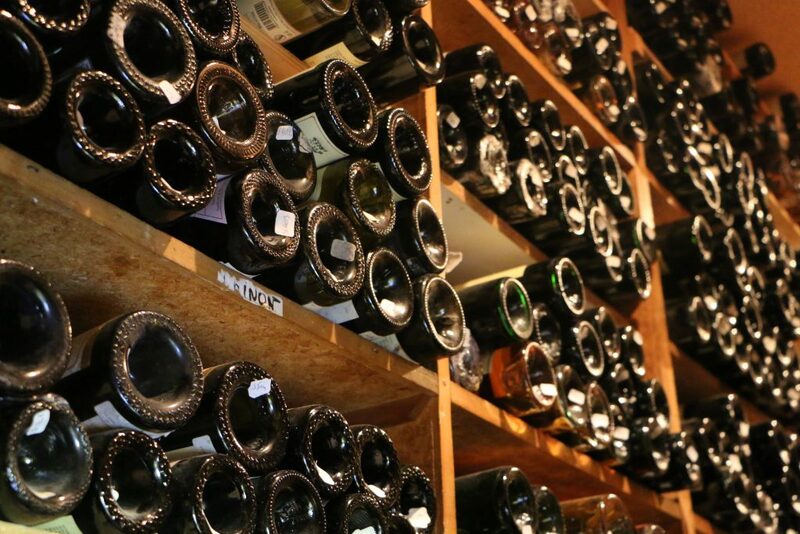 You must search for it, just like a truffle. But once you find it you won’t be disappointed. 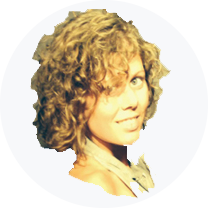 When you step inside you´re met by beautiful wood beams. 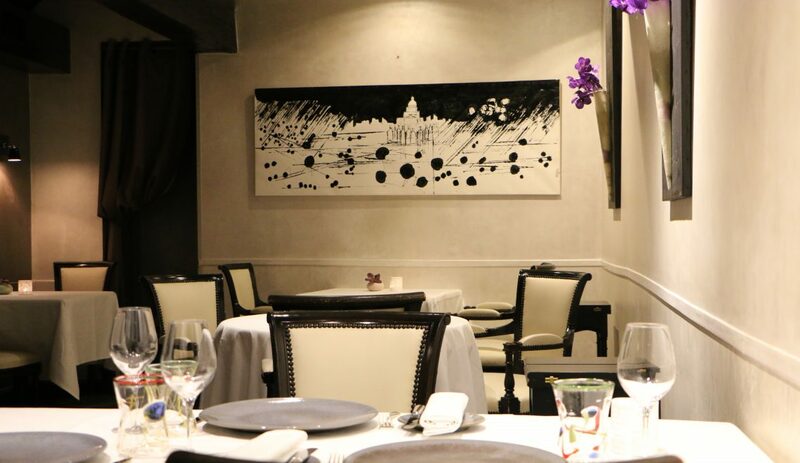 A charming and intimate ambience combined with the best of French tradition and culinary renewal. 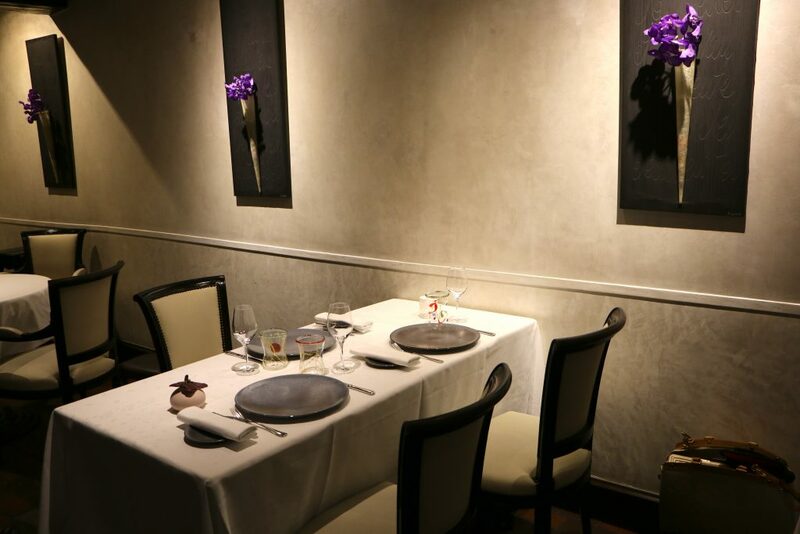 You’ll find yourself surrounded by the colors of a truffle which creates a perfect harmony in the concept. 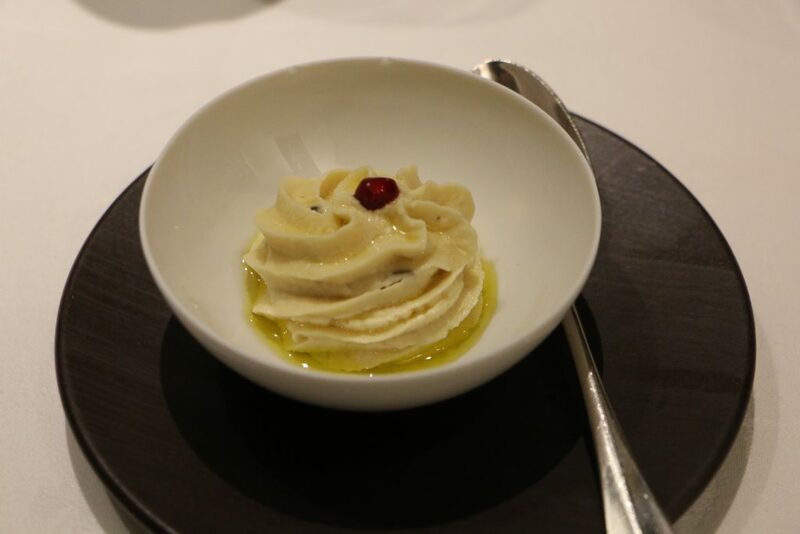 Since February 2016, the chef Christophe Poard has been working in the kitchen of La Truffière…and his many years of experience from famous establishments such as: The Restaurant Vieille Fontaine **, Le Taillevent ** * , The Jamin *** (with Joel Robuchon) and the Grand Vefour ***…has made him an excellent chef. He has earned several awards. 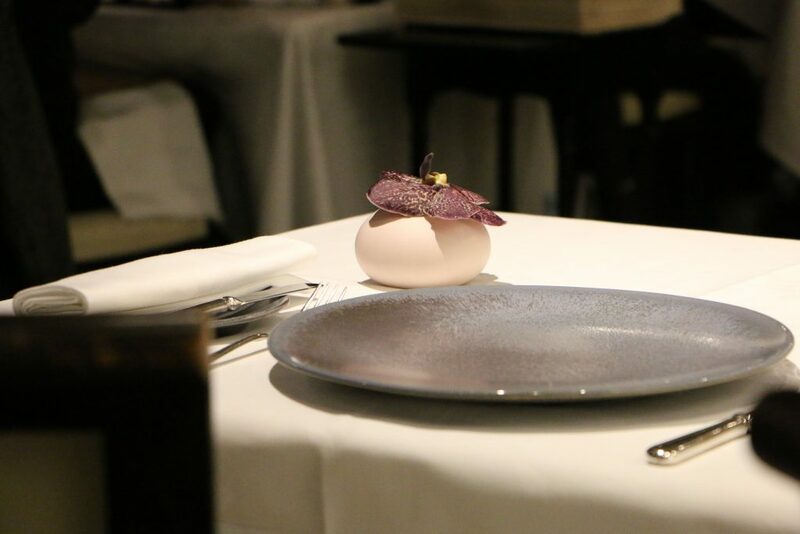 So no wonder why you can expect to be surprised..
As the name of the restaurant already reveals the truffle is in focus. 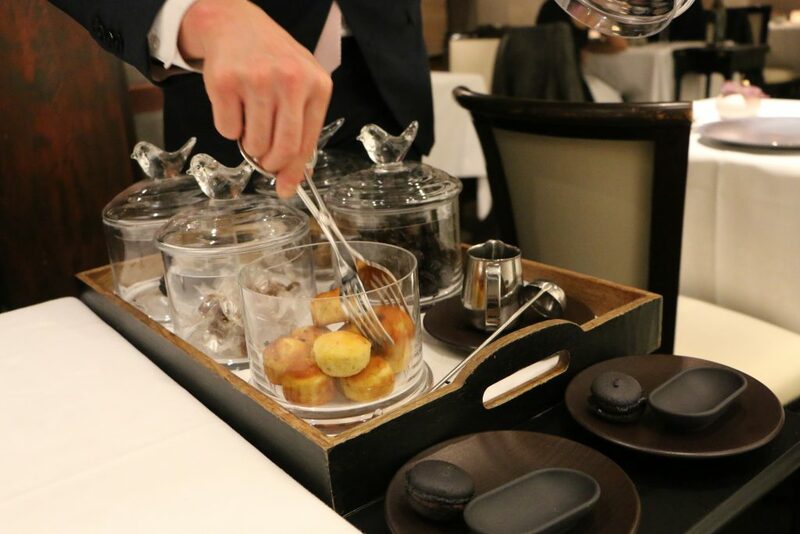 For those who don’t know much about the real truffle, I can tell that it´s a real luxury. 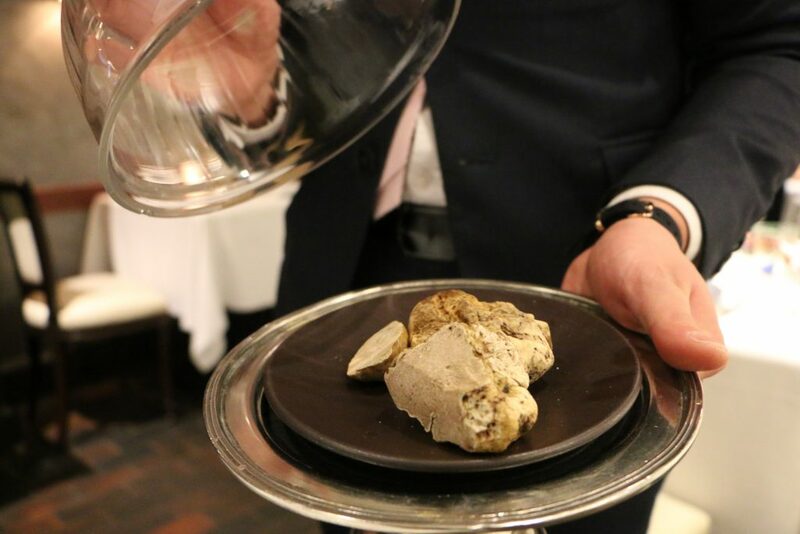 The black truffle from Périgord costs up to 1200€ /kg, and the white (the rare one from Italy) costs up to 4000€/kg. 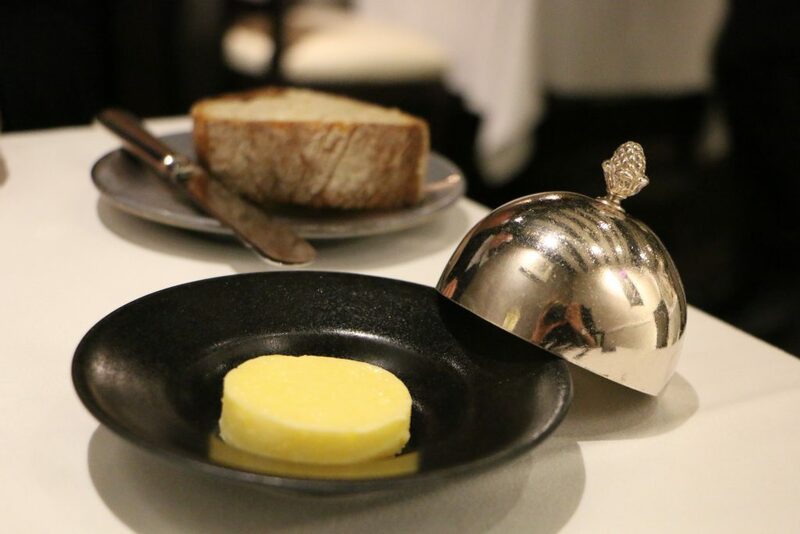 I promise you can taste the difference, even on the simplest products like the butter, compared to the ones you’re used to! 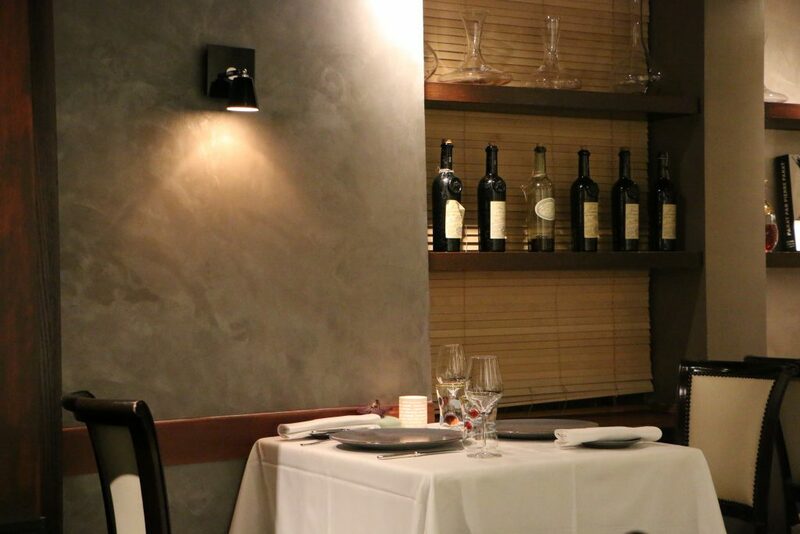 The Signature menu, consists of 7 dishes and with an accorded wine menu with amazing wine. 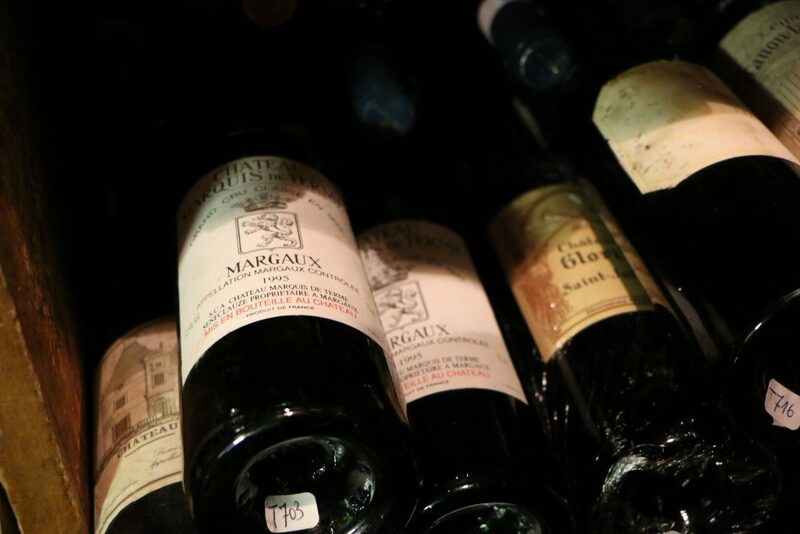 The wine waiter has been named “the best in France” and came with some excellent recommendations. 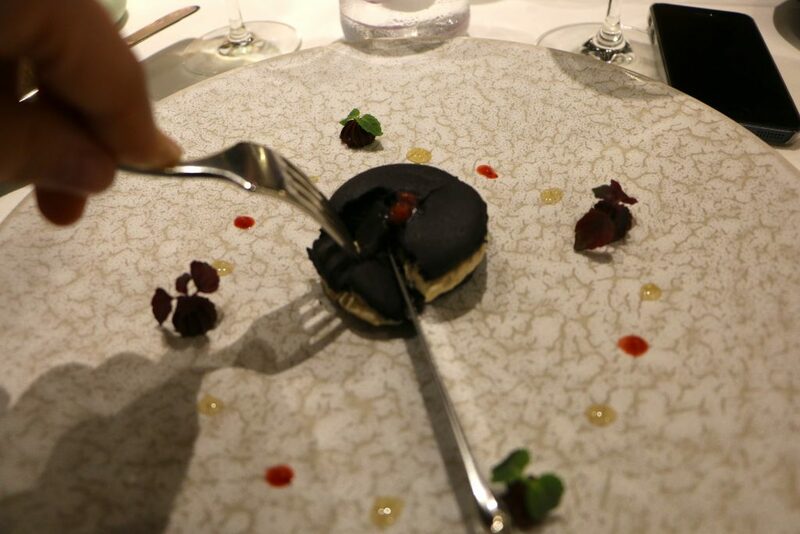 First a « Mise en bouche » was served: A puree of pickaxes with truffle oil – A promise of the amazing food experience that awaits you! 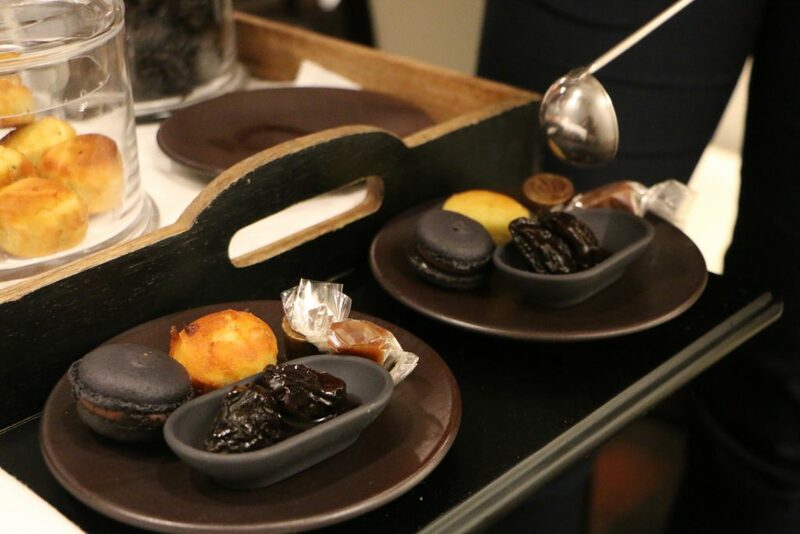 The same with the second Mise en bouche: A chocolate macaron with truffle, sweet and salty where the note of truffle appeared in the beginning and soon was replaced by the taste of chocolate. Amazing and surprising. Next to it I found a fluffy little peas and mint ball – light as a sky. 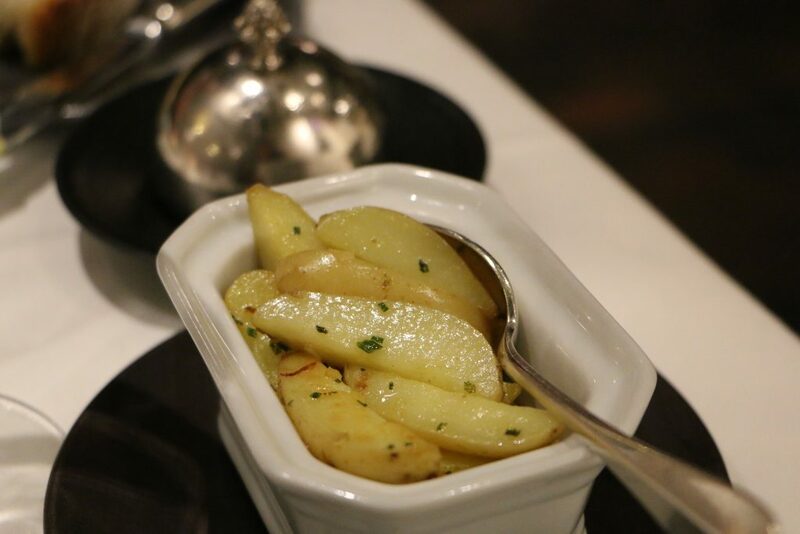 And in the end potatoes, with vitelotte and grapefruit jelly cream. 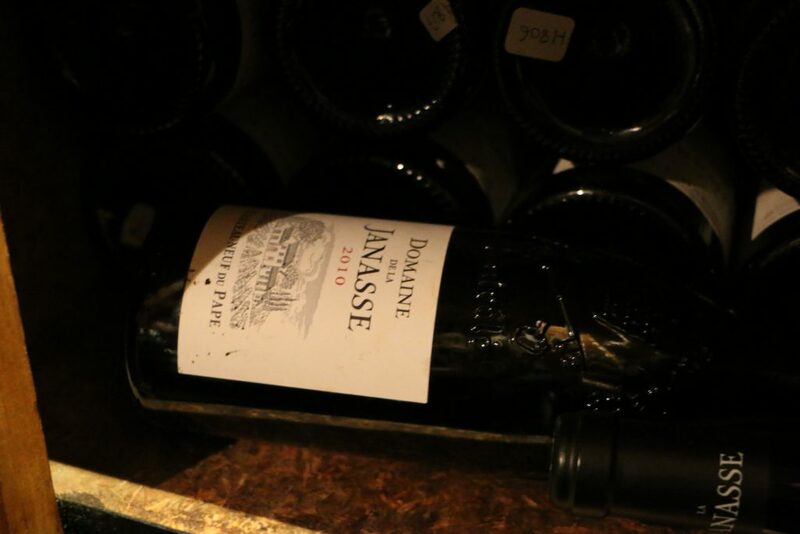 Definitely a composition that awakes your curiosity: with its original twist and surprisingly good taste. 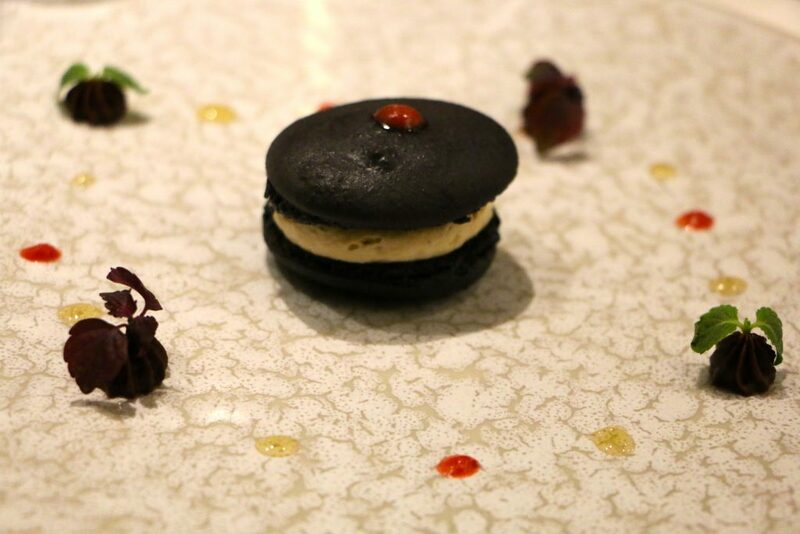 A macaron with Duck foie gras from Pays d’Auge, filled with chocolate ganache with black truffle, mango and pineapple chutney. 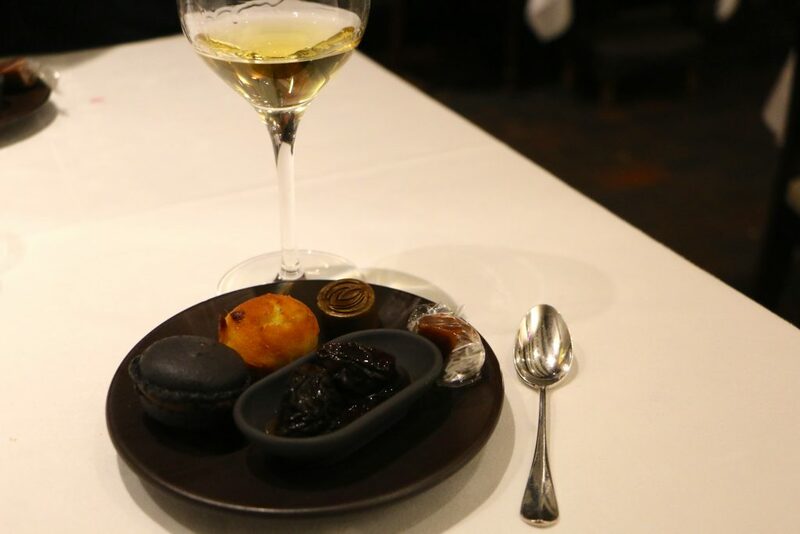 I loved the contrast between the sweet chocolate and the truffle, and then the fois gras to give it some edge. It was amazing – just like a rainbow that reveals it’s many beautiful facets and leaves you with a feeling of fascination. 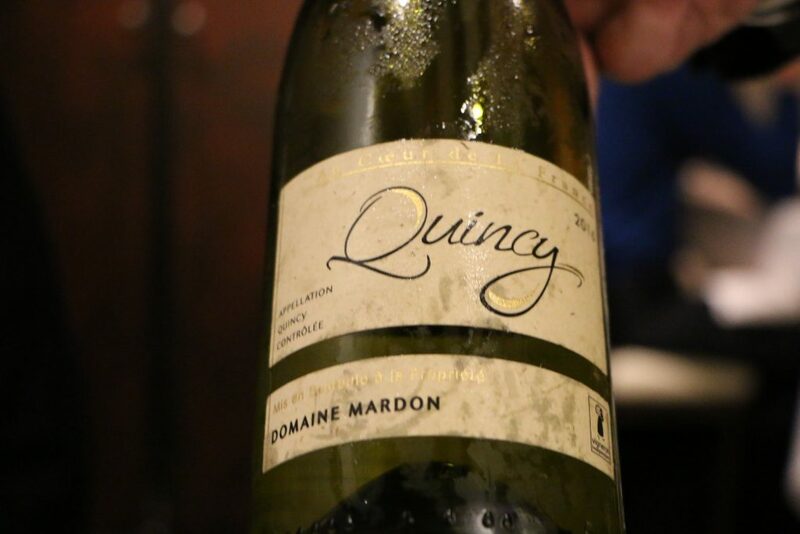 1st wine: A Ouiney white wine. I took away the eventual bitterness of the chocolate. 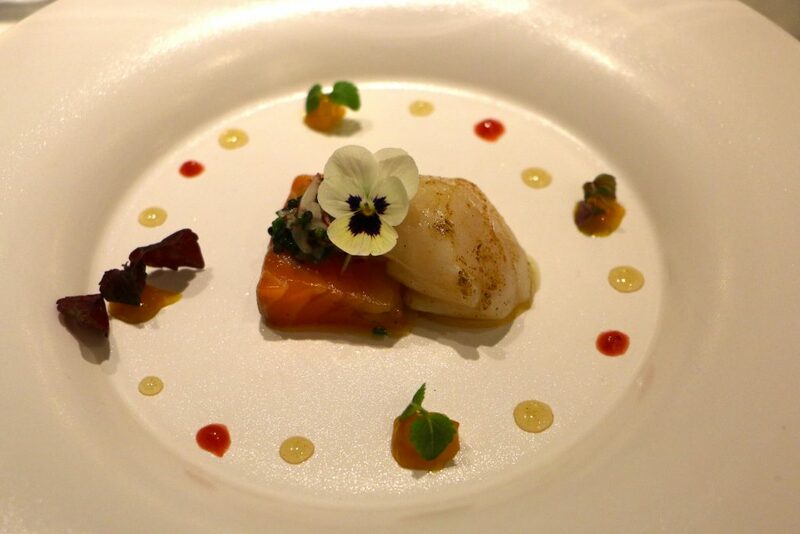 The second starter: A Sea scallop and marinated salmon from Scotland with diced radish candied. It was soft and absolutely perfect. If you enjoy fish regularly you’ll definitely be able to notice the difference between an ordinary fish and this one! There was no doubt about the excellent quality. 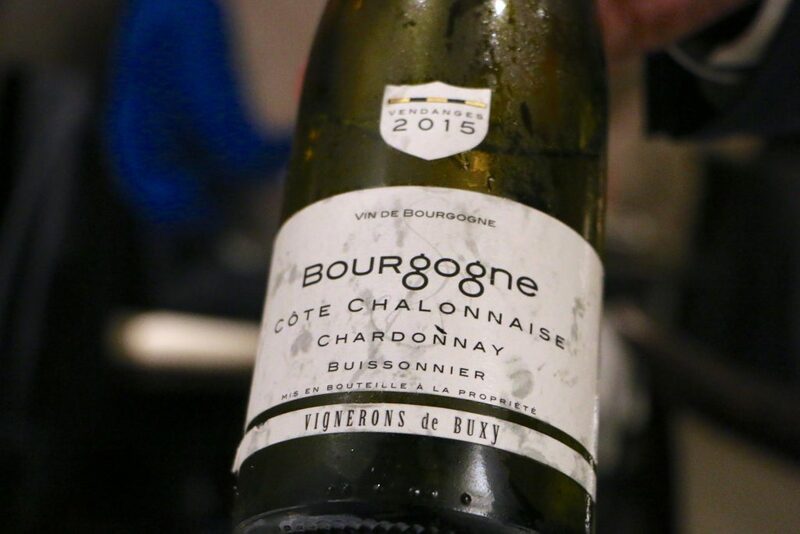 The wine: A spicy and bright Bourgogne wine…very mature and gourmand. 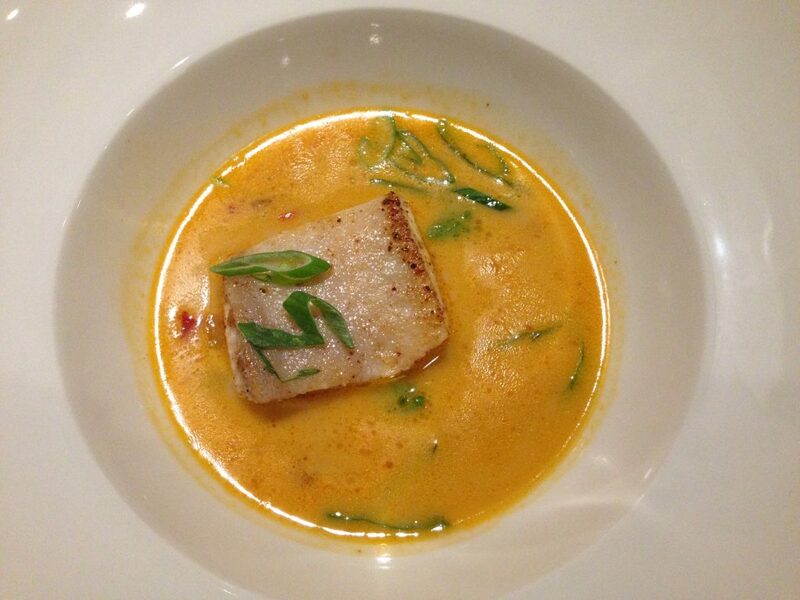 Then the wild turbot came on the table with shells and saffron juice…Excellent! Taste of pepper and saffron was fantastic. I loved it. 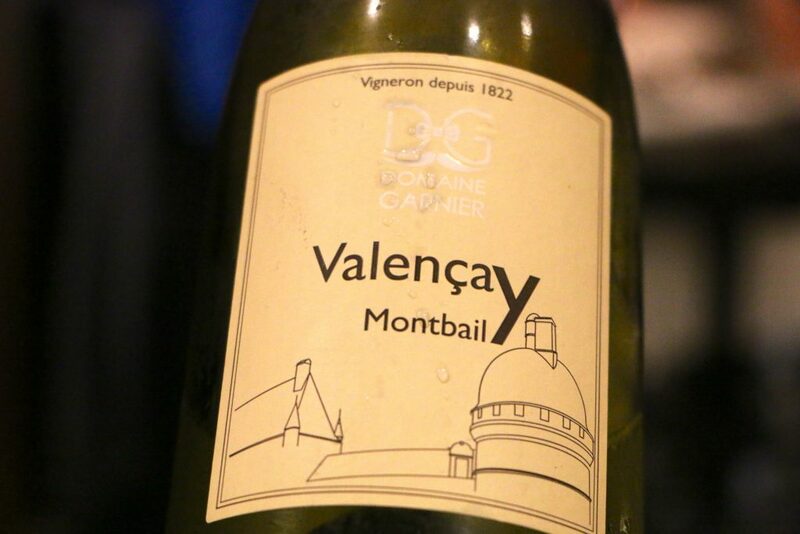 The wine was a fresh and bright Valencay from La Loire. 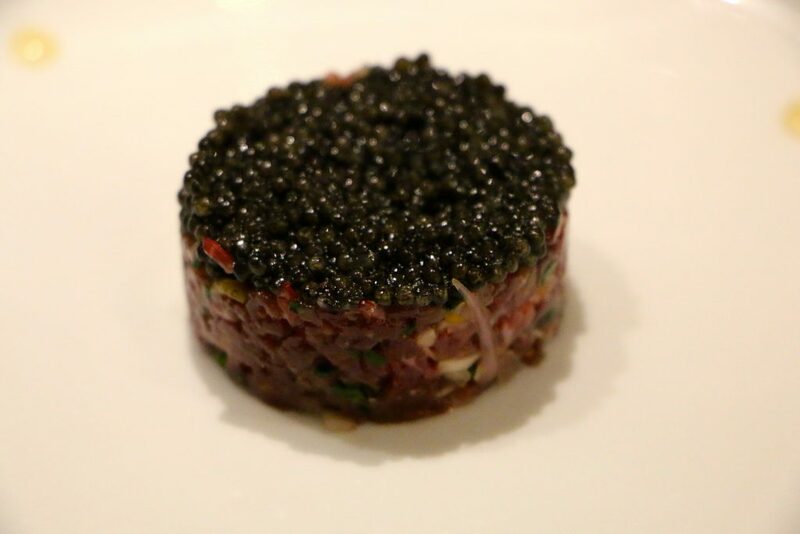 The next main course was a smoked beef tartar and oyster (Served with Oscietre Caviar from Neuvic). 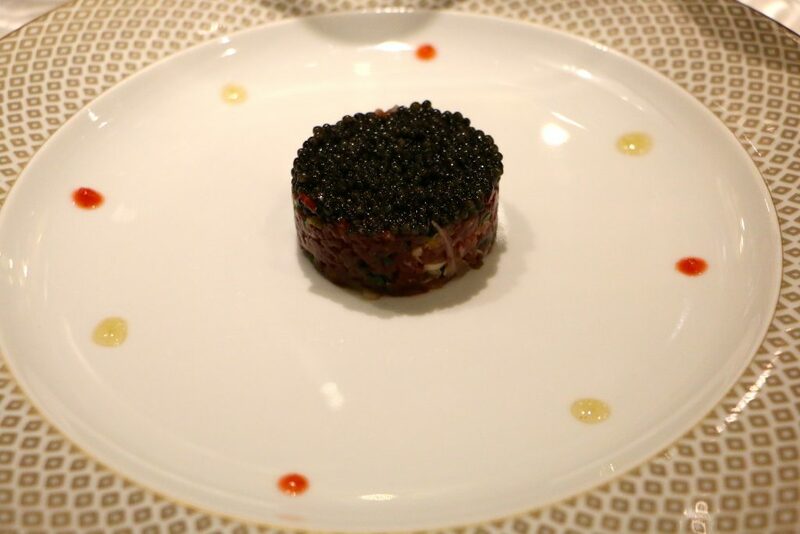 First you taste the beef, then the caviar. Very well though to serve this plate just before the meet. 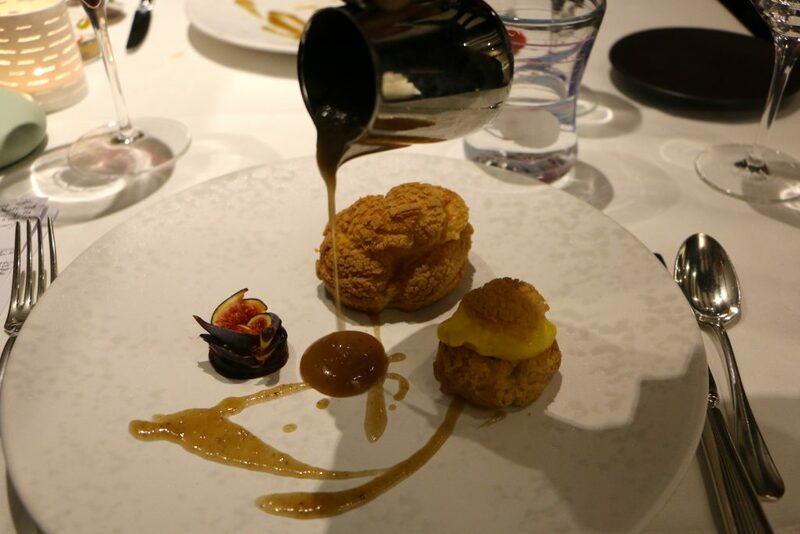 It’s like every dish has been through thought down to the smallest detail. 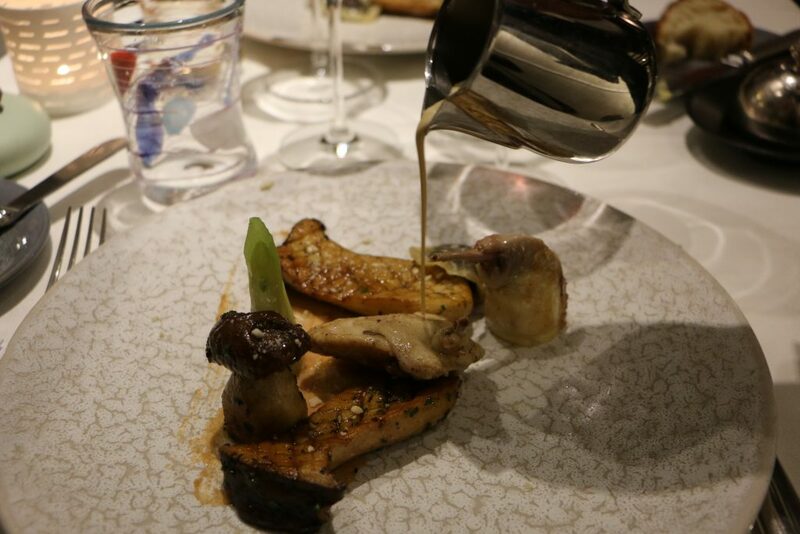 Then we proceeded to a half roast quail with foie gras sauce and fresh fig. Amazing! Caramelized, sweet and extremely delicious. So well done! 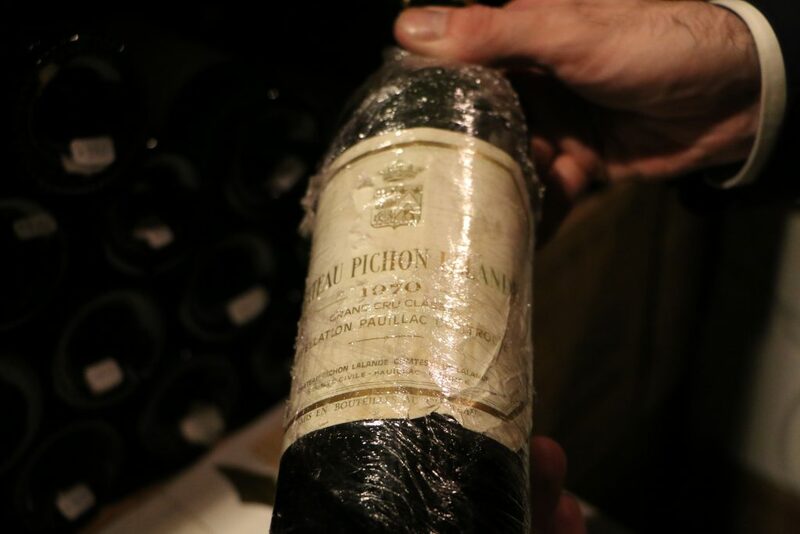 The wine that accompanied it is my new favorite! It was sublime! 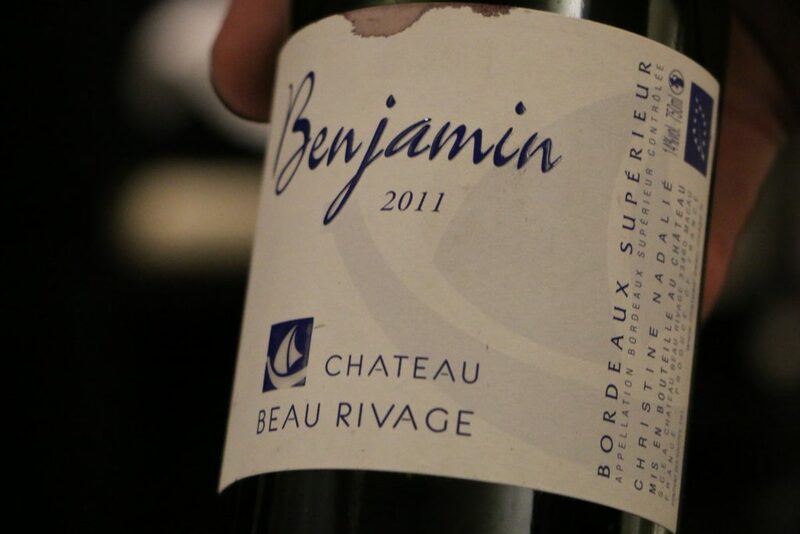 A Bordeaux from 2011 with a taste of mature cherries! A real wow experience! 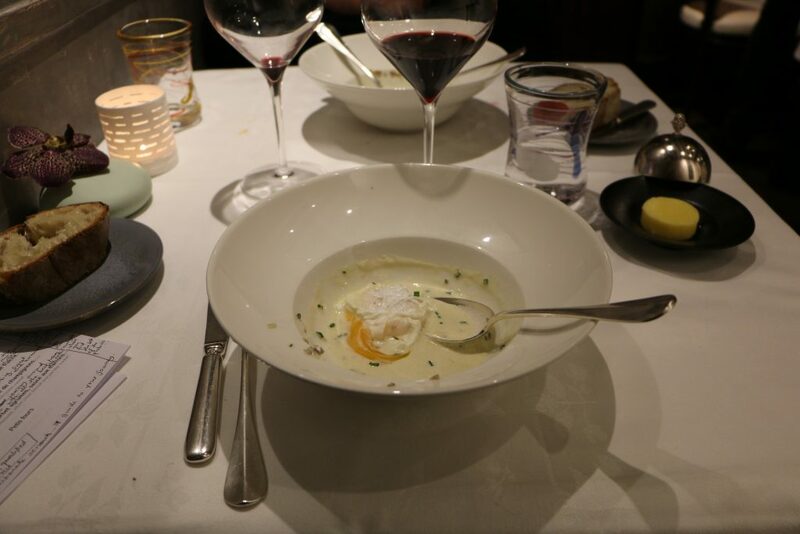 The same with the cheese soup with poached egg and mushrooms ravioli. Like an original painting, an art; the yellow floated out into the neutral cheese color and created a sort of beautiful pattern. I loved it. This actually said something about this whole experience: every dish was surprising.. its taste, its colors, its combination. It was magical and really positive! 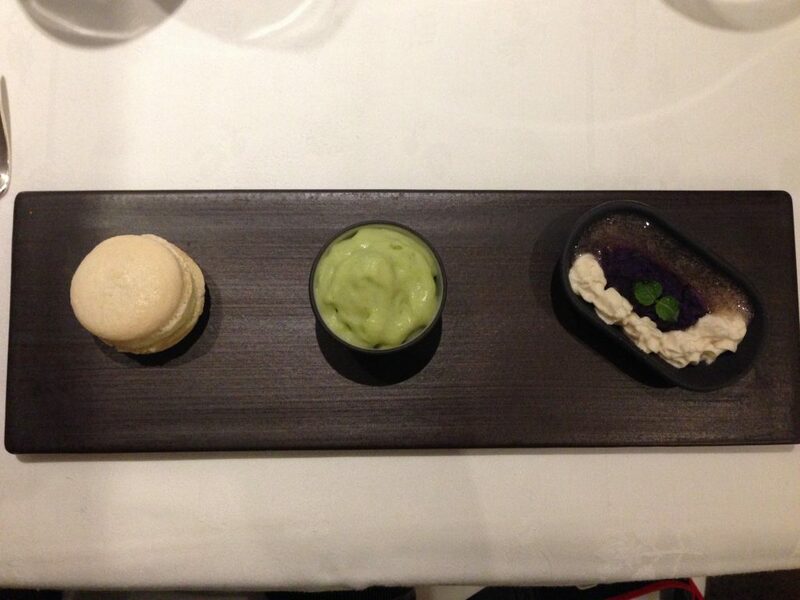 Dessert: A Verbena mousse, strawberries of the moment, short crust biscuit and parsley sorbet…delicious. At that moment my stomach was full and thanked me for this rare food experience! 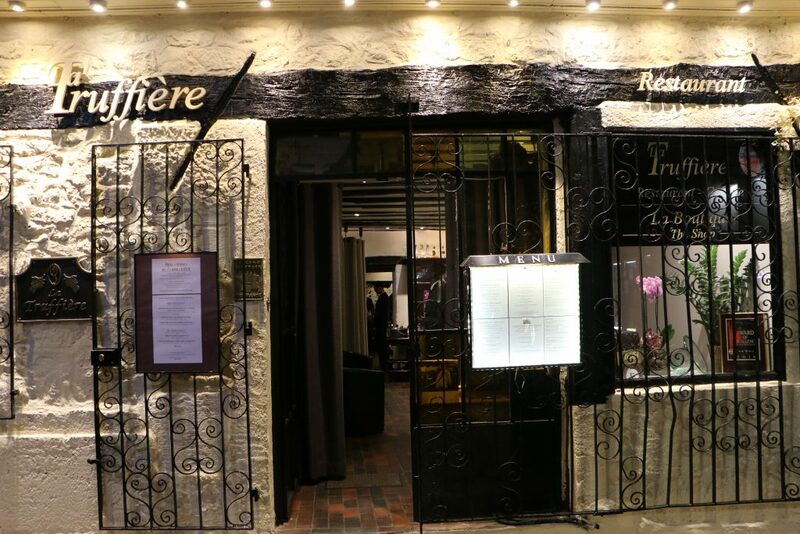 I had a splendid evening at La Truffière restaurant. 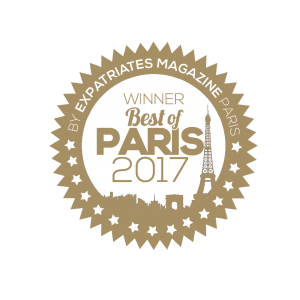 Such a professional and qualified service… the best of the best! 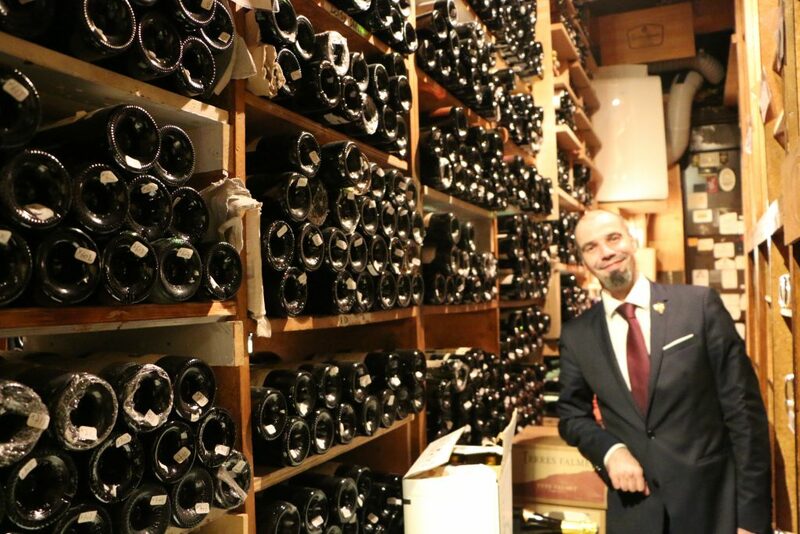 The best wine waiter in France, the best wine, the best food experience, the best service.. what else is left to say?